Lemon guava, also known as the common guava (Psidium guajava) is a deliciously sweet and remarkably healthy tropical fruit. Guavas are native to Central and South America and are very similar in appearance to apples or pears and generally about the same size as them. They contain small amounts of important B vitamins and minerals. More important, they are an incredible source of vitamin C, a potent natural anti-inflammatory, antibacterial, antioxidant and anticancer nutrient. Even more, guava boasts a high fiber content, comparable to that of nuts and seeds, and thus promotes digestive and colon health. What does (un)ripe guava look like? There are several major guava varieties, all of which differ in terms of size, shape, weight and color. Generally, guavas are round, apple or pear-shaped with either a thin or a thicker green rind, similar to lemon rind. They are usually about the size of an apple or pear, but can sometimes grow up to the size of a grapefruit. Unripe guava is bright green in color, with a whitish pulp which can stay white even when the fruit is ripe. However, many varieties of guava have a beautiful bright pink or delicate orange pulp when ripe. Also, the rind of such varieties may turn from bright green to a softer yellow-green, lemon yellow, orange-red or deep red as the fruit ripens. Last but not least, guava seeds are creamy-white in color and disposed either circularly or ovally. Again, depending on the variety, they can be either hard or tender and vary slightly in number. Pretty complicated, huh? What does guava taste like? Generally, guava pulp is either sweet or sour. Sweet varieties are quite fragrant and taste like grapefruit and pear together, although they also remind me a bit of strawberries. What does guava smell like? Although some fruit may indeed smell a bit to ripe, you know you’ve found the perfect guava when you sniff it and a strong sweet, floral, tropical smell hits you hard. Also, guava pulp, rind and seeds are all edible. Although the rind may appear inedible, it should actually be soft and sour-sweet. You can take out the seeds if you don’t want to eat them, have difficulty swallowing or are experiencing a lump in throat sensation. It’s the fruit itself that has the most benefits after all. Also, avoid cracking guava seeds with your teeth because they are quite hard and you risk damaging your teeth. Find out more about the Pill Stuck in Throat Sensation and what to do about it. 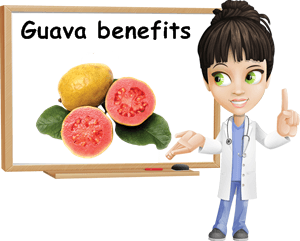 What is guava good for? Here are the most notable 7 nutrition facts and health benefits of guava. 1) Promotes digestive health and reduces colon disease risks. 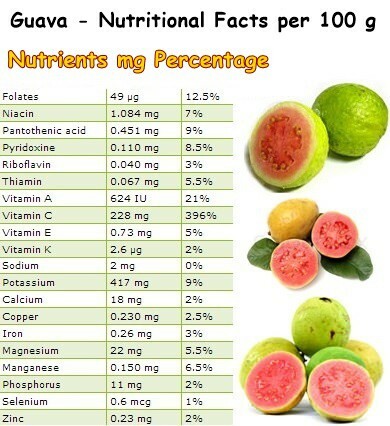 Guava has a high dietary fiber content: 5.4 g of fiber/100 g of pulp. The fiber in guava is actually soluble which means it absorbs water and makes stools softer and thus easier to pass. This not only limits strain, but also protects against hemorrhoids by preventing constipation. Also, an overall generous daily fiber intake is said to contribute to maintaining colon health by reducing the time it is exposed to the toxic compounds in waste. 2) Diabetes control. The soluble fiber in guava makes us feel satiated faster and longer by slowing down the digestion process. This allows for sugar to reach the bloodstream at a steady pace, preventing fluctuations that may negatively impact energy levels. It also helps regulate post-meal blood glucose levels as well as reduce insulin resistance, which leads to a better management of prediabetes and type-2 diabetes. 3) Potent antimicrobial action. Guava is an incredible source of vitamin C, containing 396% of the RDA of this essential nutrient. Vitamin C is a great antimicrobial, having been shown to effectively boost immunity by increasing the aggressiveness of white blood cells and reducing the frequency, duration and severity of most colds and infections. Moreover, vitamin C speeds up wound recovery and promotes vascular health. 4) Remarkable antioxidant and anti-inflammatory activity. With such an incredibly high vitamin C content, guava is an excellent anti-inflammatory and antioxidant. Antioxidants protect cells and DNA from reactive oxygen molecules (free radicals) which disrupt the activity and normal life cycle of cells, causing them to mutate into cancerous cells. The damaged caused by free radicals, known as oxidative stress, has been linked to high inflammation levels. Inflammation is believed to be a factor contributing to the development of chronic disease (diabetes, cancer, cardiovascular disease). A diet consisting of vitamin C-rich foods such a guava constitutes the best prevention method for a variety of chronic illnesses. 5) Rich in lycopene. Red guava is an amazing source of lycopene, a powerful carotenoid also found in generous amounts in watermelon, tomatoes, grapefruit and red bell peppers. Lycopene is responsible for the red color of the fruits and vegetables and boasts amazing antioxidant activity. Studies are being conducted to prove the effects of the carotenoid in cancer prevention and treatment (see benefits of lycopene). 6) Good source of vitamins and minerals. Guava contains moderate amounts of vitamin A, folate, pyridoxine, potassium and small amounts of manganese and magnesium. Vitamin A maintains healthy mucous membranes at the level of the mouth, nose, eyes, lungs and stomach and contributes to good immunity. Folate prevents spinal defects in newborn babies and is thus an essential nutrient for pregnant women. Magnesium maintains the health of the heart muscle, while potassium regulates blood pressure. 7) Wrinkle prevention. The high content of vitamin C in guava stimulates the production of collagen, a protein that gives structure to tissues, skin included. A high production of collagen helps delay aging signs such as wrinkles and saggy skin, helping us look younger. Conclusion. Overall, guava is an extremely healthy fruit with an above-average nutritional profile. Regular consumption appears to help prevent the onset of chronic disease and improve health quality. It only has about 68 kcal/100 g so it is also figure-friendly. If you are lucky enough to benefit from fresh guava on a regular basis, then don’t hesitate to enjoy it every chance you get.